Formally Honeywell was not Honeywell, at first they were the Solvay Process and then it was Allied Chemical witch both dumped harmful chemicals into the lake. Honeywell's plan is to cover the lakes perimeter to halt the pollution from entering the lake. Once the entrance of the pollution is gone the inside will be easier to get rid of, and eventually the bottom will be clean too. the surface and the bottom of the lake are being worked on right now and they say the clean-up plan will be reached by 2016. They will be recreating the habitats s all of the animals will come back to the lake. Once the goal is reached the lake will be able to give food, water, and entertainment but who knows what the Haudenosaunee will think of the. completion. 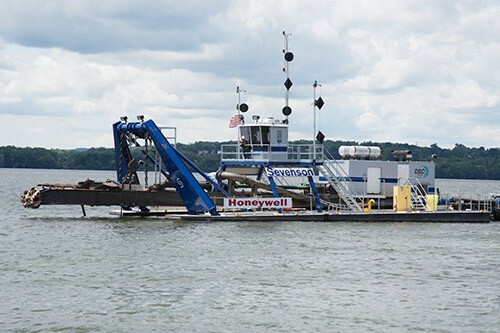 Our class went to visit the Onondaga nation and we saw the Honeywell dredging it was far a way but it as cool to see it work.Also, as you see we learned a lot also we had lots of fun. the fact that shocked us the most was that the lake can be cleaner then green lakes! But it smelled really bad there but the tour girl said this is as smelly as it ever get!